Fried chicken is on the rise. It may be the pork belly of 2012. In the continuing wave of upscale comfort food, whether fancy burgers or macaroni and cheese, fried chicken is enjoying its day in the sun. A well deserved high profile after soaking in deep fryers for many long years paying its dues. 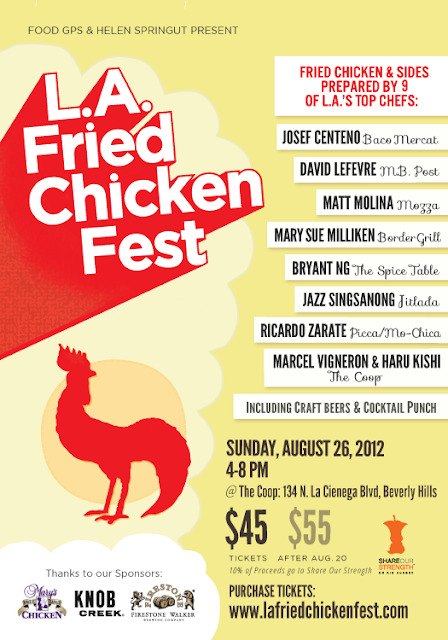 This Sunday will be the premiere of the L.A. Fried Chicken Fest, at the Coop (aka Gonpachi) on La Cienega in Beverly Hills. Nine of LA's most popular and talented chefs will each be making their own take on Fried Chicken (that is eight versions as Marcel Vigneron and Haru Kishi are collaborating on their dish). There will be Asian, Latin and European takes on the American classic. The list of participating chefs is a whose who of recent award winners, such as Ricardo Zarate from Mo Chica and Pica and Bryant Ng of the Spice Table, who won Food & Wine Magazine's Best New Chef in 2011 and 2012, respectively. Tickets are $55 and are in limited supply. No tickets will be sold at the door. So get on the waitlist or do what you gotta do, as this fest is not to be missed. Sunday, August 26th from 4 - 8 pm. Where else will you get to see Beverly Hills housewives chowing down on golden bird? Plus there is a charity component as 10% of proceeds will benefit Share Our Strength. This is going to be one finger lickin' good afternoon.